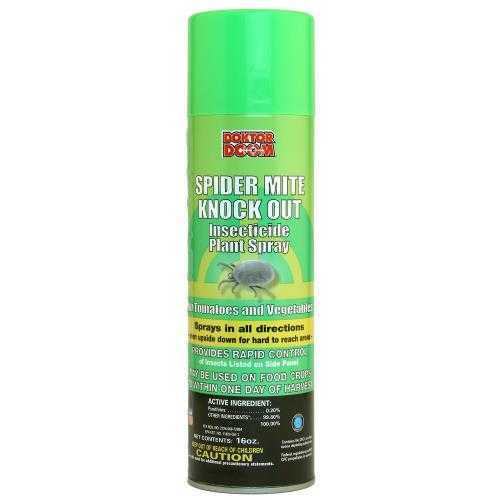 Doktor Doom® Spider Mite Knock Out® is a 0.20% pyrethrin formula. This formula is 19 times stronger in active ingredient pyrethrin than any soap based insecticides and 10 times stronger than any formulations that contain Pyrethrin & Piperoynl Butoxide. Piperoynl Butoxide is a synergist which enhances the killing power of Pyrethrin and it is not approved for organic gardening. Doktor Doom® Spider Mite Knock Out® kills the pests on contact with just a light misting on the foliage. Apply the Doktor Doom® Spider Mite Knock Out® to the underside of the leaves and then fog the room with a Doktor Doom® Fogger.